There are so many progressive jackpots out there that never seem to be won. Not so at WinADay Casino! Most of the unique slot games there are tied to one progressive jackpot that gets his several times a year. True, it doesn't get to million dollar levels when it's hit that often -- but a quarter million win would be fine by me thanks! The unique slots and video poker site has just paid another jackpot winner one of its biggest progressive jackpot pay outs ever. Alfred F won $213,367 playing Alice in Wonderland. He’s been an avid WinADay slots player since 2010 -- his favorite games are Gladiator Games, Aztec Adventure, Vegas Mania, and Aces and Faces – but this is obviously his biggest win ever. Last fall, Dean S., a WinADay regular since 2010, won $217,167 playing the Wild Alaska slot game, continuing a trend toward larger and larger jackpots at the popular slots and video poker site. Not long before that, Taryn L won nearly a quarter million dollars—WinADay’s second largest jackpot ever -- playing Leprechaun Luck. Vera M. had recently won a record-breaking $255,462 jackpot on Chinatown. 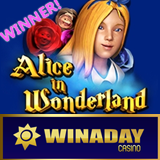 Just by playing any of the no-download instant play casino’s one-of-a-kind games, all WinADay players now earn Comp Points that can be converted into rewards. VIP players earn bonus comp points -- points are tripled for Platinum VIPs. Collected points can be converted to cash with more kinds of rewards coming soon.